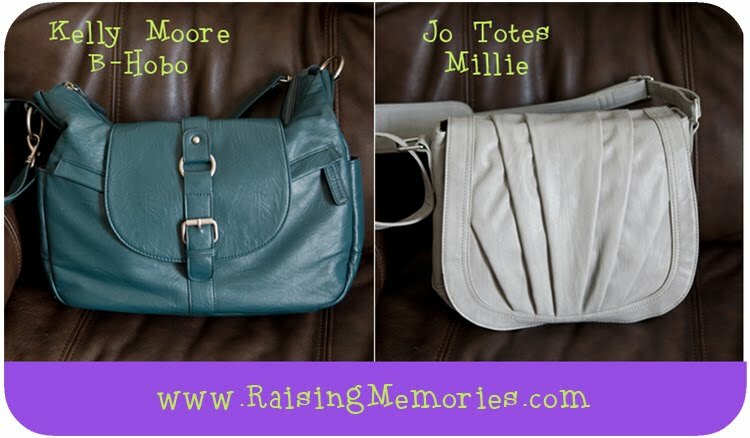 So, I've posted about the Kelly Moore B-Hobo Bag and I've posted about the Jo Totes Millie Bag. Now I want to give you a little comparison between the two incase you're out there shopping and trying to make a decision between the two. First of all, they are both great bags & I'm quite happy with them! So, it's really going to come down to the specifics of what you're looking for, and what your preferences are. Here's how they arrived (each in a bag like this, protected). 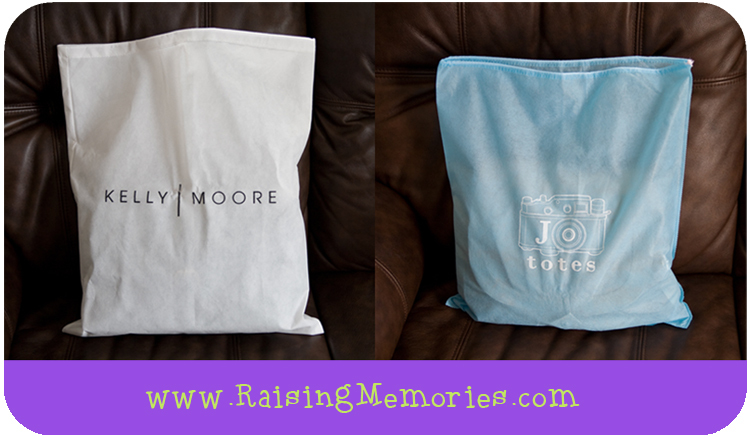 The protective bag for the Jo Totes bag was a little flimsier than the Kelly Moore one, but they both do the job! Both bags close with a flap. The Kelly Moore B-Hobo Bag has an invisible, magnetic snap that attaches at the front of the bag. 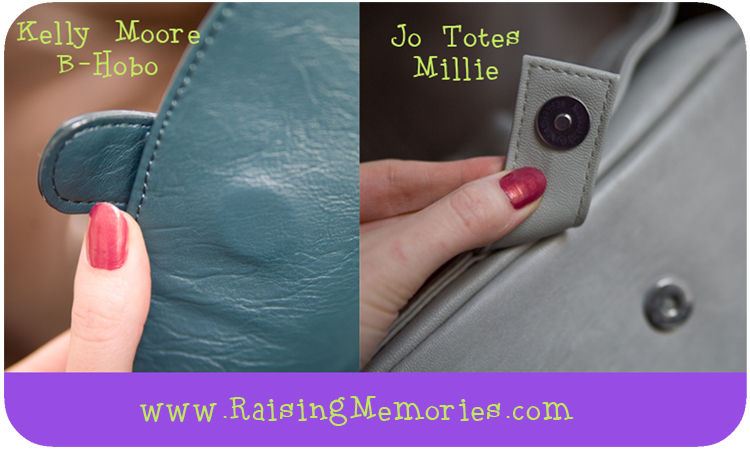 The Jo Totes Millie Bag has a visible magnetic snap that attaches at the bottom of the bag. Between the two, I prefer the B-Hobo's closure. I like that it doesn't sit on it when I set the bag down, but mostly, I find that it is easier to close the B-Hobo than the Millie because I have to fiddle with the snap to make sure it closes for the Millie- which is sometimes a little tricky since it is pretty full with my camera in it (but it still works, and it's not a big deal for me to close it without bothering to snap it). The Jo Totes Millie Bag has one adjustable strap that can be made long enough to wear across your body or short enough not to. The Kelly Moore B-Hobo Bag comes with 2 removable straps. 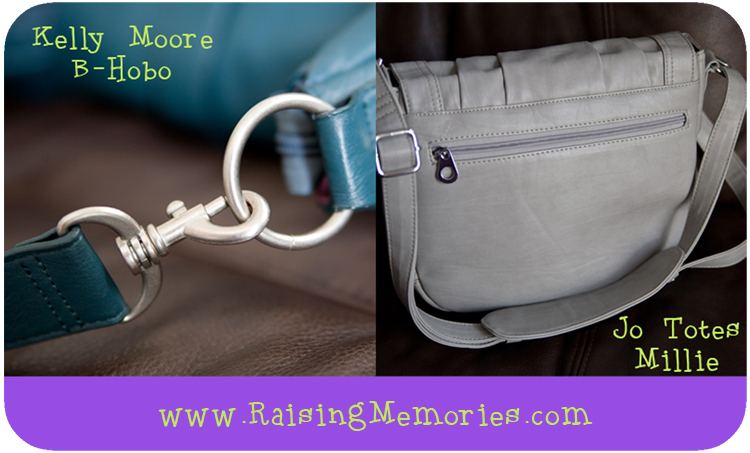 One is long & adjustable, the other is short (not adjustable) and great for wearing the bag as a purse, under your arm. Both bags come with 2 removable, padded dividers. The Jo Totes divider is definitely thicker/puffier than the Kelly Moore one. This makes me feel like it's safer, but I have had the B-Hobo for over a year & never had any reason to think the thinner divider doesn't do a good job. (Also, from the photos on their website, I belive Kelly Moore's bags now have a thicker/puffier divider). The big difference between the two bags is that the Kelly Moore B-Hobo Bag is bigger than the Jo Totes Millie Bag- I can fit one more lens in the B-Hobo. You can see more photos and details about each bag in their individual reviews. [B-Hobo & Millie]. As always, if you have any questions, go ahead & post them in the comments & I'll respond! This is just the review I was looking for! I've been trying to decide between these two. How do you feel that they have held up since using them? I have a different camera bag and I feel like it hasn't held up as well for what little use I've gotten out of it. I'm so glad the review was helpful to you! The only way that either of the bags has shown wear is that on the bottom of the Kelly Moore bag there are a few very small nicks in the "leather"- they are pretty tiny and they haven't spread. There is also one very small one on the bottom of the Jo Totes bag. Otherwise, they are still both in excellent shape & I do use them quite a bit!